What a week this is for investors. Whether you're a veteran investor, a professional in financial services or a student studying business, there's an event you can cash in on during International Financial Week, which opened Monday, with the Asian Financial Forum, and continues through this Friday. The Hong Kong Venture Capital and Private Equity Association is, I'm pleased to note, involved in four Financial Week events, including tomorrow's EMPEA Private Equity Masterclass and, of course, today's Asia Private Equity Forum, the auspicious eighth edition, no less. In the Chinese culture, the number "eight" promises prosperity, and a multitude of other good things. And I hope the year 2018 will be a good year for all of us. For Hong Kong, of course. Things are looking good lately. Hong Kong's economy is expected to have grown notably by 3.7 per cent last year, the fastest growth in six years. This is largely attributable to vibrant external trade, underpinned by much improved global economic conditions, as well as solid growth in domestic demand and a state of full employment in our labour market. The economic outlook for 2018 remains very positive. The HKSAR Government will continue to promote diversified economic development, while managing risks amid vigorous capital flow, rising interest rates and technological revolution. With that in mind, we are working diligently to enhance Hong Kong's competitiveness and economic development. When it comes to financial services, consolidating our leading role as a regional asset-management centre is a policy priority. So, too, is promoting the development of Hong Kong's fund- and asset-management industry. Our combined fund-management business grew by 5.2 per cent, year-on-year, to the end of 2016. That, ladies and gentlemen, realised a record-high US$2.35 trillion. Funds from non-Hong Kong investors accounted for two-thirds of that. In short, we're attracting a world of investment. Private equity has become an increasingly important piece of Hong Kong's asset-management business. At the end of last September, Hong Kong's capital under management in private equity had reached almost US$130 billion. Over the same period, total private equity funds raised added up to more than US$13 billion, putting Hong Kong second only to the Mainland of China in the Asian region. To that end, we are rolling out measures to remove legal hurdles, broaden the fund industry's distribution network and create a more favourable tax environment. The Securities and Futures Commission is now working on the legislation's operational and procedural rules. And we hope to launch the open-ended fund company structure later this year. To complement it, I proposed, in last year's government budget, to extend the profits tax exemption to onshore, privately offered OFCs. The bill was introduced into the Legislative Council last June, and we are working now to make it a go. We are also very much focused on opening up sales channels for funds. Our mutual recognition of funds arrangement is a case in point. We have, in recent years, reached agreements with the Mainland, Switzerland and France to expand the distribution network for Hong Kong's fund-management industry, while boosting development of our asset-management business. The Securities and Futures Commission is now negotiating similar arrangements with several other jurisdictions. And, of course, our unique "one country, two systems" framework with the Mainland creates opportunities available to no other economy. We are, rest assured, taking full advantage of them. We have recently devised new strategies to further expand Hong Kong's listing regime to attract new economy companies to come to here for listing, including pre-revenue companies and companies with weighted voting rights structure that meet specific requirements. The Hong Kong Stock Exchange, in consultation with the Securities and Futures Commission, will formally consult the market on the relevant details within this quarter, actually by the close of February or the latest, beginning of March. We are hoping to see the listing of more tech companies in Hong Kong in the second half of this year. And when it comes to capital, to fund-raising, we expect that the Renminbi will increasingly become the currency of exchange as China continues to open up its capital markets and as the internationalisation of the Renminbi continues to gain pace. Global demand for Mainland assets will also invariably increase. Good news for Hong Kong, the world's largest offshore Renminbi business centre. In March last year, Premier Li Keqiang announced the Guangdong-Hong Kong-Macao Bay Area development proposal. The Bay Area, with an aggregate population of 68 million people and a total GDP of over US$1.4 trillion, is the fastest growing region and the most affluent region in China. That offers unprecedented opportunities for our asset management and wealth management business. Innovation and technology will be a key area of focus in terms of Hong Kong's co-operation with neighbouring cities in this region. I am sure it will provide a cluster of innovation and technology business in the areas of artificial intelligence, Fintech, biotech and smart city, and this will offer venture capital and private equity sector with many more exciting investment opportunities. Ladies and gentlemen, business-friendly, capital-rich, super-connected Hong Kong is flush with more than money. Our ambition is equally outsized, as is our ability and resolve to realise whatever is we set out to achieve. 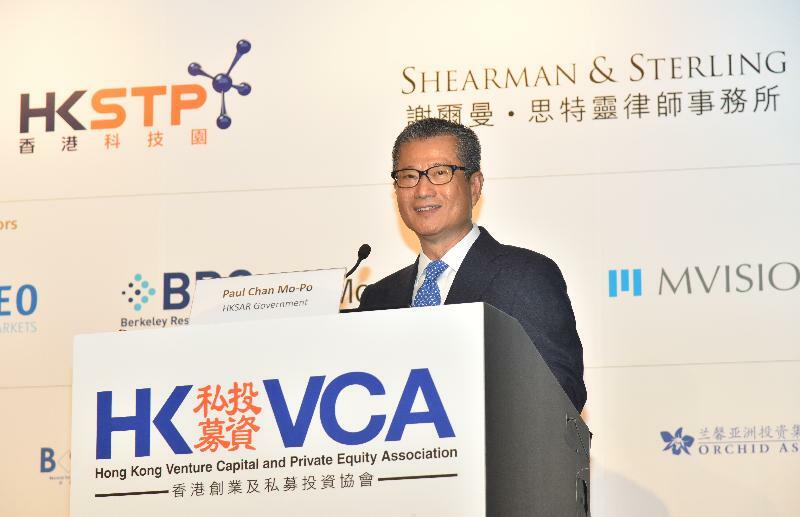 The Hong Kong Venture Capital and Private Equity Association is a clear testimony of that. Many thanks to the Association for promoting and protecting the interests of our venture capital and private equity sector over these past 30 years. And for organising, so well, this welcome annual gathering. With the Year of the Dog less than a month away, I wish you all a happy, healthy and, yes of course, prosperous 2018.